King of Rzeczpospolita (Polish-Lithuanian state) Sigismund II Augustus in 1572 issued a decree to establish the Ukrainian registered Cossacks troops. Initially, the registry consisted of only 300 of Zaporizhzhya Cossacks, led by the leader. In 1578 the registry has been increased up to 600 people and the Cossacks were in possession of the city Trakhtemyriv in Kiev province. Housed here Cossack arsenal and hospital. In 1630-ies the number of registered Cossacks Zaporozhye or grass-roots army reached 6 - 8 thousand people. Under the terms of the contract Zborowski in 1649 their number had risen to 40,000, divided into 16 regiments of resettlement sites (Chigirinsky, Cherkassky, Kanevsky, Korsun, Belotserkovsky, Pereyaslavsky, Umansky, Bratslav, Vinnitsa, Kropivyansky, Mirgorodskii, Poltava, Prilutsky, Pavolochsky) . At the head of each regiment was Colonel, assisted by captain and regimental clerk. The regiment was divided into ten hundred, commanded by captains. Hundreds were divided into kurenni headed kurenny leader. Hetman of all the army was appointed by the king and received from him the dignity of the signs: banners, horsetail, mace and seal. Hetman helped troop sergeant, consisting of a notation clerk, esaul, cornet, colonels, captains and atamans. The Government of the Commonwealth Cossack leaders bestowed the rights of Polish gentry. 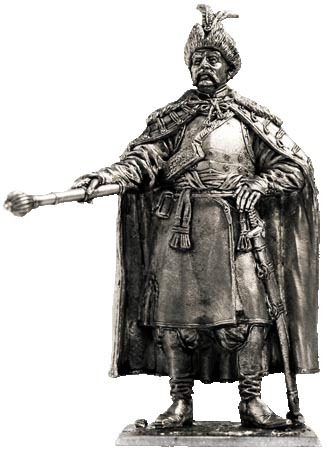 Cossack colonel dressed in a Polish style. Cap of crimson velvet with fur edging decorated with feathers. Steel Breastplate put on Uhocha of patterned satin material. Red silk sash woven in gold. Dark blue trousers tucked into yellow morocco boots. On the shoulders draped with green velvet kuntush folding sleeves and fur collar. On the chest hangs bandolier of red leather with gilt cover. In the right hand mark the commander's rank - a gilded mace-pernach.